Launching with an hour-long show is great. A half-hour launch leaves a scrambled sense of the panelists, and their passion for their chosen works is nothing but a blur before it’s time to relegate one of those to the sidelines. Did the montages for each book make the best use of that extra time? I’m not sure: spoilers make me edgy, so summaries that manage to reveal two-thirds of the books’ contents in only a few sentences, rub this reader the wrong way. For me, I’d rather hear a passage from the work, or a selection of key words, with the rest left to the reader to explore. But how petty is all of that. What I love about this show remains intact: a group of people who love to read, readers who are concerned that some great books are going unnoticed, who are willing to publicly debate the merits of their favourite works. Did I love it just as much on radio, without the video broadcast? Yes, but I think that’s just me being old-fashioned. If I’d been born a hundred years ago, I’d still be buying oats and straw and insisting that a good horse would outdo an au-to-mo-bile any day of the week. And, yes, I’d be saying it with each syllable distinct, surrounded on each side by my inherent resistance to change. We all have it, right? That sense of being comfortable with the way that things are, that wish that they (or some things anyway) could simply stay the same. I do think a valid point was raised in the first session, about the prevalence of traditional ideas about what makes a book a book, about what makes a great read, about what makes essential literature. Tradition is a heavy-hitter. Still, I’m awe-fully disappointed that Jeff Lemire’s Essex County has been eliminated from CBC’s Canada Reads. And I’m awe-fully disappointed that storytelling is so often viewed in narrow and exclusionary terms. But I also would have taken a different approach in defending this work. I would have looked back at the different ways in which stories have been told throughout the ages. Oral traditions. Wonder tales. Epic adventure poems. Shakespearean drama. The medium might be different, but the way that the onlooker can engage with the substance of the story is not. I’d’ve insisted that a story is a story is a story. Tellers spin their tales using different means. And then I would have drawn connections between the themes of Essex County and each of the other nominated works (link Vince’s struggle for success with The Bone Cage, link the country nurse’s losses with Rita Winters in Unless, link the contentious camaraderie of the hockey players with the political players in The Best Laid Plans, link the historical passage of time and the depiction of isolated communities with The Birth House). These comics are telling the same kinds of stories that the other nominated novels are telling: stories about ordinary people’s lives. For those who challenged that dealing with these universal themes requires more ink be allocated to the printed word, I’d point to John Steinbeck’s Of Mice and Men, Franz Kafka’s Metamorphosis, Kate Chopin’s The Awakening, Muriel Spark’s The Prime of Miss Jean Brodie, Stephen Leacock’s Sunshine Sketches, and George Orwell’s Animal Farm. Both Sarah Binks and Next Episode have proven that a Canada Reads book doesn’t win based on the number of words in it. Good literature doesn’t come with a standard word count. For those who are concerned that comics belong in Bazooka bubblegum wrappers, I’d point to Art Spiegelman’s Pulitzer for Maus. And then I’d slip my finger along the shelf that contains Marjane Satrapi’s Persepolis, Joe Sacco’s Palestine and Safe Area Gorazde, Chester Brown’s Louis Riel, Josh Neufeld’s A.D. New Orleans After the Deluge, Inverna Lockpez’s Cuba: My Revolution, and Chris Ware’s Jimmy Corrigan. Yes, Carol Shields won a Pulitzer, but so did Art Spiegelman. So. It’s not the medium, it’s the story. This story can hold its own alongside other works of fiction. A good story’s length is not the measure of its worth. Drawing and storytelling are creative art-forms. And. Then. For strategy. I would have attacked every other book at that table for NOT being illustrated. Were any of Dickens’ works published without illustrations? Does anyone want to suggest that Andrew Wyeth should have left his paintbox closed? Why dismiss a book with pictures? Why not observe the lack of illustrations, why not harp upon their omission? For strategy, I would have pulled out a single hapless sentence from one of the other works, a single sentence that tries to contain something monstrous in it, but which cannot hold the depth and breadth of emotion in the same way that the work overall might hold. And then I would have pointed to a single frame in Essex County that manages to capture something more than words could hold alongside that image. If readers have dismissed Essex County because they were looking for something more novelistic, then they’d better be eyeing Carol Shields’ Unless next because it inherently challenges the form. But I don’t think that’s really why Jeff Lemire’s trilogy was dismissed. It’s a strong drive, the need to stick with what we know. Lester felt it. Vince felt it. Uncle Ken felt it. 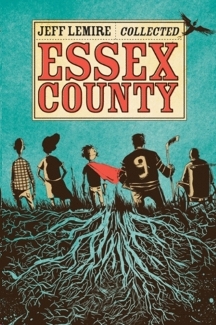 Jeff Lemire’s Essex County is a very traditional tale. And it has pictures. Why is that so threatening?